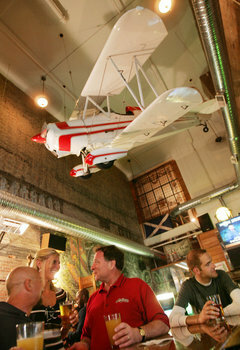 Gillespie's Map Room, tucked into a long, narrow space along West Ninth Street, bills itself as "your neighborhood pub." That's true, given its proximity to the plethora of apartments and condos bordering the east bank of the Flats. Drinkers on my two visits wore jeans, khakis and shorts and appeared to have dropped in to meet friends, catch a ballgame, and kibitz with the staff. They were young and old.